It’s always lovely to be close to nature—plants have the ability to make any space feel fresh and alive, and create a sense of positive well-being. 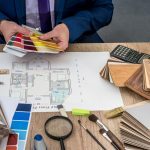 Outdoor garden spaces are at a premium, especially in today’s high-rise apartments; but even small spaces can be cleverly transformed with some big ideas! Here are some unconventional gardening ideas you can try to add a touch of greenery within your home interior! If you’re lucky enough to have a good sized terrace, you can create a small vegetable patch and grow the veggies that your family love. Even with a tiny balcony, there are many ways to carve out some space for greenery. Plan for rectangular planter boxes that can be hung on the balcony grills and are deep enough to allow proper root growth. 6 to 7 inches of soil is usually a minimum for proper rooting. The planter boxes must have proper waterproofing at the bottom. Also, do make sure that when you water the plants, the excess water does not drip down into the balconies below, or you are going to have some very annoyed neighbours! The roof of most buildings is often a space that is not used to its fullest potential. 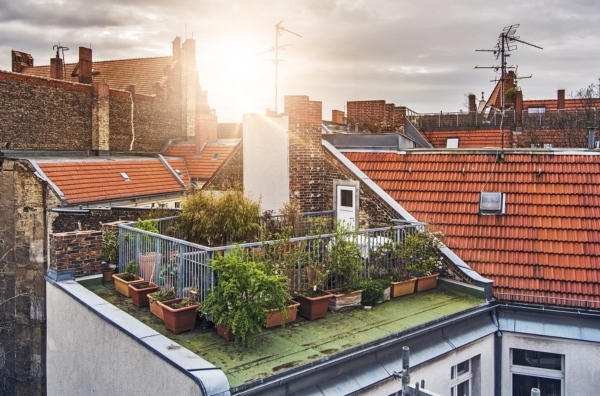 With a little thought and some ingenuity, the rooftop can be a charming space used for gardening. Sunlight is never a problem on the roof, and you can have large planter boxes filled with your choice of seasonal vegetables and herbs, ready for picking! If space permits, create a shaded seating area under a pretty pergola, string some decorative lights and you have the perfect setting for an evening get-together with friends. 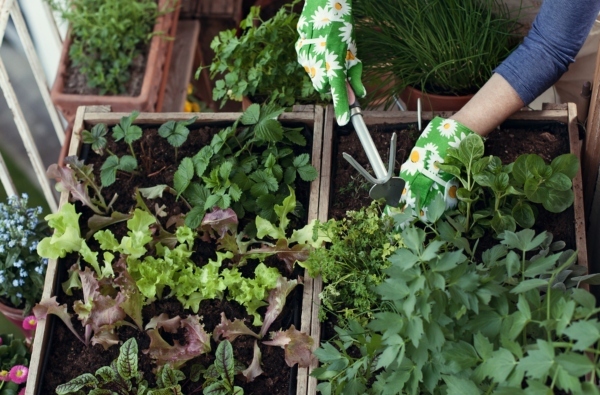 A wide windowsill that gets some sunlight can be a great place to have your vegetable garden. It’s a good idea to place a slab of granite over the sill, so that your window itself does not get damaged with all the watering! Another trick to make your vegetable garden look more appealing on an outside window is to add some pops of colour with a few small pots of flowering plants as well. This works out well for your veggies also because the bugs that get attracted to flowers attack the pests that could feed on your tomatoes or eggplants. Consider creating a vertical herb garden close to your kitchen, preferably on a wall that gets some amount of sunlight during the day. Most herbs need sunlight, but many do grow in low light. 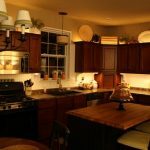 If required, you can supplement the outdoor lighting by adding track lights with sun lamps over the pots. When planning your vertical garden, you must give some thought to how the water will drain out. 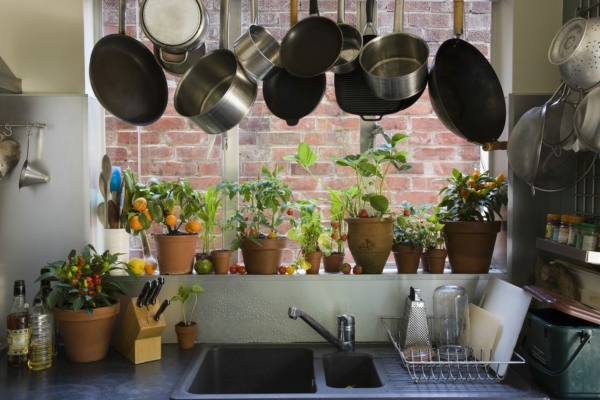 Plants that can handle more water can be grown in the lower pots as the water from the pots above will drain into the rows below. You can ask your plumber to install a simple drip irrigation system above the top row of pots so that your plants can be watered easily, without ruining the wall behind. 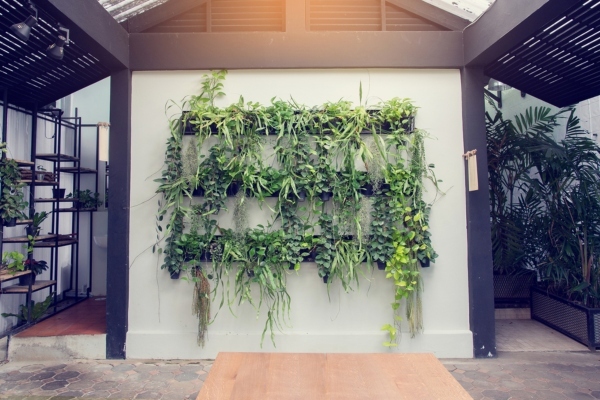 Vertical gardens look best with small, equally spaced pots of the same size with green herbs. How great does it sound that you can add some extra flavour to your cooking with fresh herbs picked from your very own garden! In many homes, the space below the stairs is wasted. This space can be utilized better and could be the perfect space for a small garden. Pebbles, rocks and flowing water can add visual and textural interest to this space. Do ensure, however, that these plants do get some amount of sunlight during the course of the day, as typically this area would not have access to much light. If there isn’t much sunlight, then you should plan to have a couple of sun lamps in this area. As a thumb rule, these ‘grow’ lights should be placed at least 2 feet over your plants and should be switched on for three hours or more every day. Some veggies that grow well indoors are radishes, turnips, lettuce, greens, and carrots. Citrus fruits, tomatoes, and eggplants are also very popular among indoor garden enthusiasts as they are non-fussy and require minimal care. Basil, oregano, parsley, thyme, coriander and mint are possible choices for herbs that are easy to grow; as are garlic and ginger, which are essentials components of almost every Indian dish! 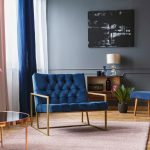 There are a great many benefits to be had from growing indoor plants in your home. Not only do they look pretty, but they also clean the air, absorb indoor heat and add humidity. There’s nothing quite like fresh organic vegetables and herbs for cooking great tasting food with the right nutrients. With some careful planning and out-of-the-box thinking, it doesn’t take much to create your own slice of nature right in your home!